Mentor Public Library is offering free classes on basic computers, Facebook, Microsoft Word, and more. We’re is hosting seven free computer classes at our Main Branch, including basic introductions to computers, the Internet and Facebook. 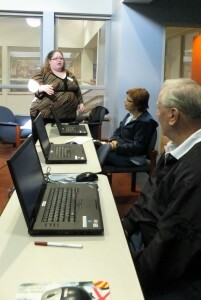 an introduction to computers—MPL’s most basic class—at 2 p.m. on Tuesday, Sept. 25. People will learn the basic skills they need to use a computer, no previous experience required. Microsoft Word I at 6:30 p.m. on Tuesday, Sept. 25, and Microsoft Word II at 6:30 p.m. on Wednesday, Sept. 26. Learn basic and then more advanced techniques for Microsoft Word. basic Internet skills at 2 p.m. on Wednesday, Sept. 26. Learn how to navigate the Internet. Participants will need to know how to use a keyboard and a mouse for this class. introduction to Facebook at 10 a.m. on Thursday, Sept. 27. The hands-on class will demonstrate basic Facebook features and tips. Please come to class with your Facebook login information and password. basic email skills at 2 p.m. on Thursday, Sept. 27. Learn how to send emails and attachments, as well as reply to other people’s emails. Microsoft Word—Flyers, Pictures & Drawing Tools at 6:30 p.m. on Thursday, Sept. 27. Learn how to use Microsoft Word 2013 to create flyers, manipulate pictures, and to effectively use Word’s Drawing Tools. All of the classes are free. However, registration is required; and, because space is limited, people will want to sign up as soon as possible. You can sign up online or call the library at (440) 255-8811 ext. 216. Additionally, your Mentor Public Library gives you free access to dozens of free online computer classes via Gale Courses. Learn everything from computer basics to advanced techniques for Microsoft, Adobe, Photoshop, and other applications from the convenience of your own computer. take free online classes with Gale Courses. Niche Academy also offers videos that explain how to use online tools like Gmail, Goodreads and social media, including Facebook, Pinterest, Twitter, Instagram and Snapchat. All of these video tutorials are available for free. You can watch as many as you like at mentorpl.org/niche. This entry was posted in Uncategorized and tagged classes, computer, computers, Gale Courses, Mentor Public Library, niche academy. Bookmark the permalink.